February 7, 2010 – FAA pilots who have a paper pilot’s license will need to change the license to the plastic license by March 31, 2010. Pilots having a paper license will not be able exercise the privileges of pilot after March 31st. Back on September 8, 2009, the FAA released a notice of change. FAR 61.19(h) reads, Duration of pilot certificates, except for a temporary certificate issued under §61.17 or a student pilot certificate issued under paragraph (b) of this section, the holder of a paper pilot certificate issued under this part may not exercise the privileges of that certificate after March 31, 2010. There are two ways to replace an airmen certificate. You can request a replacement certificate at the FAA website online. Or you can mail an Application for Replacement of Lost, Destroyed, or Paper Airman Certificate. You will need to provide your name date and place of birth, social security number and/or certificate number and the reason you need a replacement. You must include a check or money order for $2 (U.S. funds), made payable to FAA, for each certificate you request. A Pilot License (in the United States of America, Pilot Certificate) is issued by a national aviation authority and establishes that the holder has met a specific set of knowledge and experience requirements, which is sometimes determined by taking a checkride. The licensed or certificated pilot can then exercise a specific set of privileges in the nation’s airspace. Despite attempts to harmonize the requirements between nations, the differences in certification practices and standards from place to place serve to limit full international validity of the national qualifications. In the U.S. a pilot certificate is issued by the Federal Aviation Administration (FAA) — and pilots are certified, not licensed, although the word license is still commonly used informally. 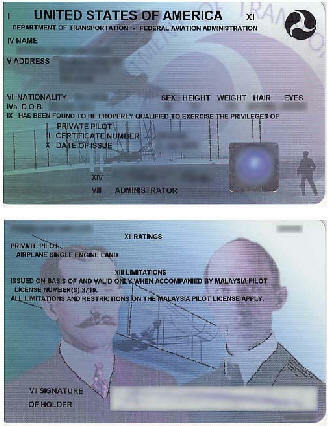 Legally, pilot certificates can be revoked by administrative action; whereas licensing requires intervention by the judiciary system. In Canada, licenses are issued by Transport Canada, and in the United Kingdom licenses are issued by the Civil Aviation Authority (CAA). • Student: Cannot fly solo without proper endorsement from a Certified Flight Instructor. Passenger Carrying is Prohibited. • Private: Passenger Carrying no longer prohibited. Cannot be paid or compensated to fly. Cannot be hired by any operator. • Commercial: Can be paid or compensated to fly. Can be hired by operators. • Airline Transport: Can act as Captain of an Air Carrier. Pilot privileges are also further broken down into category, class, and in some cases, rating. A category is defined as "a broad classification of aircraft", broken down into Airplane, Rotorcraft, Glider, and Lighter-Than-Air. A class is defined as "a classification of aircraft within a category having similar operating characteristics", which include single engine, multi-engine, land, water, gyroplane, helicopter, airship, and free balloon. In addition, a type rating is required for aircraft over 12,500 pounds, or aircraft which are turbojet powered. Further endorsements are required for high performance (more than 200 horsepower), complex (retractable landing gear, flaps, and a controllable pitch propeller), or tailwheel equipped aircraft, as well as high altitude operations. Most Private Pilot certificates are issued as "Private Pilot: Airplane Single Engine Land", which means the pilot may employ his piloting privileges in any single engine, land based airplane in which they are qualified. A pilot is only qualified in the category and class of aircraft in which they successfully complete their checkride. Therefore, a pilot who takes a Commercial Pilot checkride in a multi-engine, land-based aircraft and passes may only exercise the privileges of a Commercial Pilot in multi-engine, land-based aircraft. That pilot may not exercise the privileges of a Commercial Pilot in single engine or sea-based aircraft without passing the appropriate parts of a checkride in those particular categories of aircraft.